Clear Airport Security Program Closes Abruptly; Goodbye Flo, Too? The Clear airport security program has abruptly closed. No warning, and no information beyond a sparse statement on the Clear web site. An email to members also went out about an hour ago with the same short statement on the site. NOTE (Sept. 20, 2010 : See Clear Airport Security Is Back, With All The Downsides about the resumption of the Clear program, after Clear closed on June 22, 2009. Also see my category on Clear for any further news about the program that I may have posted since this note. Clear, or Fly Clear as it was sometimes known, allowed people to bypass regular security at some airports for an annual fee. I’ve been a regular user since it started. In fact, I was probably one of the program’s most successful affiliates. I’d written about it from an early point, and so many people used my code to get an extra month (and giving me one in the process) that my card was good through 2064. The main issue to me about a 3 year or longer period is that Clear itself isn’t guaranteed to exist that long. So far, they seem to be expanding and doing well. They probably will be around for 3-5 years. But in 10 years, who knows how airport security is going to change — and $1,190 is a lot to gamble on that. I guess even expecting 3 to 5 years was too optimistic. It’s amazing — rather appalling really — that nothing remains up on the site for those who were members of the program. How much time did you have left on your card? Will you get any refund (given the credit problems, I doubt it). Clear also ran a special affiliate program for selected “Refer-A-Friend” members paying $20 for each referral between November 17 and December 17, 2008. I don’t think I had any referrals that qualified during that period, but others might. If they weren’t paid (it can take months for a referral to count, as this only happens when the new person’s enrollment is complete), some people might be owed money. Of course, the bigger issue is for all those travelers who as of 11pm Pacific time tonight will find that Clear lanes have closed down. Apparently, airports offering the Clear lanes also had no previous notice. It’s pretty disappointing. I’d hope that someone is able to step in and perhaps pick up where Clear left off. After a rocky start (see my post below comparing Clear to a system in the UK), I found the machines became more dependable. 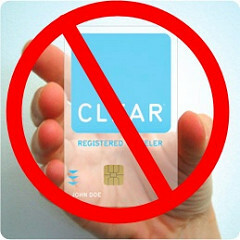 It was certainly a relief for me to use Clear when I’d be flying out of airports that offered it, such as San Jose. Un-Clear: Registered Traveler Company Shuts Down: From the Wall St. Journal, says Clear had over 150,000 members. The second largest company, Flo, now becomes number one. There’s currently nothing on the Flo site offering any suggestion of taking over the Clear network. Flo serves just over 15 airports. Clear served just over 20. The list is still available in Google’s cached copy. That will go soon, so here’s a copy for historical purposes. I’ve noted where Flo also operates and bolded the places where only Clear was operating. At some of these airports, I’ve never seen Flo actually in operation (though I’ve hardly been looking for them, of course). SEE POSTSCRIPT BELOW — FLO DOESN’T HAVE TERMINALS IN THESE PLACES BUT INSTEAD WAS PIGGYBACKING ON CLEAR. Registered Traveler flier-pass vendor Clear shuts down: From the Los Angeles Times, has little more than the Wall St. Journal but says Clear claimed to have nearly 250,000 members. Via MousePlanet, Clear Shuts Down Registered Traveler Lanes from Aviation Week notes that at least one airport, Orlando International, didn’t get notice of the closure until this afternoon. Ironically, Clear still appears to be running ads on Google soliciting sign-ups, though clicking on them brings you to the Clear home page saying the program has closed. As of only a few days ago (June 18), the company also emailed members with a special enrollment offer to buy a year and get a free $30 Brooks Brothers gift card. Email subject line: “Reminder: There’s still time – Dad deserves 5 star service (and a new tie).” So much for that gift for dad, and kind of sucky to be pushing new enrollment when the company had to know it was days from closing down. I’ll postscript more news, as I get it. If you’re considering Flo and can wait, I’d hold on a few days. It seems likely they’ll make some type of special enticement to bring in Clear members or better, that they’ll perhaps obtain Clear’s assets. Plus, it’s probably worthwhile waiting until the inevitable analysis happens of just how healthy Flo itself is, before plunking down more money. Photo credit for opening image: I modified this image from RustyBrick in violation of its stated copyright guidelines. But since RustyBrick is also Barry Schwartz, my news editor over at Search Engine Land, I think he’ll forgive me). Steve Brill’s Clear Card Gets Grounded: from AllThingsD, covers the $116 million in investment that Clear raised since 2005, including $44 million less than a year ago. Clear traveler program shuts down: From the Denver Post, mainly says if you hit the Clear booth at Denver, you’ll get directed to special lines for frequent flyers who qualify for other express treatment. Clear lanes to shut down at Hartsfield-Jackson: From the Atlanta Business Chronicle, cites Atlanta airport officials saying that new, non-premium security lines have reduced security times for anyone to below 10 minutes, on average, perhaps making the use of Clear less essential. I’ve certainly seen that on occasion at San Jose, where using Clear didn’t save me much time at all. But on other occasions, it was a life saver. More than anything, it made my security time dependable. I knew I’d always be able to get through quickly, rather than the crap-shoot you sometimes encounter at an airport. CLEAR Airport Verified Identity Pass calls it Quits: From ZDNet, touches on the mishap where a laptop with Clear data about 30,000 Clear members went missing. It was eventually found, I believe, but when some people were already sensitive about how much data that Clear gathered (see Chris Sacca’s Not So Clear For Me post), it didn’t help the company’s prospects. TSA’s Registered Traveler program grounded: From USA Today has further background and statement that Brill was surprised that an agreement couldn’t be reached with creditors. Security firm calls it quits at the SLC airport: From the Salt Lake Tribune says that airport got the news of the closure over this weekend. Clear, aka the “TSA fast pass,” shuts down: From Boing Boing, touches on the privacy issues. Also covers this being Brill’s second “turkey.” Though in bowling terms, he’ll need the new journalism company to tank to have scored a true turkey. Lots of comments starting on the Boing Boing post, too. Postscript 4: Clear Card Aiport Security Program Clears Out: From KTVU, says Clear employed 50-60 people at San Francisco Airport alone. I’m also waiting to hear back from Flo and hopefully I’ll have some news to add directly from them. Per Vincent’s comment below, it turns out that Flo doesn’t actually have its own terminals in many of the places it lists on its web site. Instead, if you look closely, it calls the places it operates “Registered Traveler” airports — Registered Traveler being the US government program that licensed companies like Clear and Flo to operate. Basically, Flo appears to have been sending its members into Clear lanes. Now that those Clear lanes are gone, Flo may have few or no lanes of its own. Indeed, the Flo site consistently talks about “Registered Traveler” airports rather than “Flo” airports, a clever (or sneaky) way of making the program appear to be more stable than it actually is. I get the impression that the death of Clear means that Flo will have problems shortly — certainly there’s no compelling reason to purchase from them, that I can see. I still haven’t heard back from Flo itself, other than an email I sent yesterday was being reviewed by upper management. On June 22nd our competitor and fellow Registered Traveler Service Provider, Verified Identity Pass (also known as Clear), announced immediate cessation of operations at all of their airports. Flo is currently working with other participants in the industry as well as the Transportation Security Administration to analyze the implications of this announcement and to formulate a plan for the advancement of the program. We have no additional comment at this time but would expect to release further information pending a public statement from the TSA. Um, if Flo depends on Clear terminals, I’d sure expect a better update than that. As for the TSA, I see nothing about the closure of Clear so far, nor on the official TSA blog. “Interoperable” with all Clear lanes sounds great except for the fact that those lanes themselves aren’t operating. Nice spin. Are the only places with terminals that can accept cards from any Registered Traveler program company, Flo, Vigiliant and perhaps Clear cards still being honored. See you in Reno! Fast-pass security lanes at San Jose, other airports close down from the San Jose Mercury News covers how the first ever airport to get a Clear lane — San Jose — only got a few hours notice that the program was closing. CLEAR Update: What Happens to Your Personal Data, Comment From Steve Brill from the Wall Street Journal covers the data question, that it’s apparently being held by Lockheed Martin and can only be claimed by the TSA. Maybe, says former CEO Steve Brill — since he’s not there anymore, even he’s not certain if terms have changed. Story also suggests seeking a credit card refund — I’d definitely try this, for anyone who was recently charged. Overall, what a mess. Are Clear cards valid in some other places? If so, shouldn’t Clear tell people not to do stupid things like destroy them? I’d definitely like to see someone from the TSA get moving on help sorting out the situation, as they ultimately oversee these programs. Postscript 6: See the continuation of this story, TSA Stays Silent As Its Registered Traveler Program Melts Down. I’ve also closed comments here, so they future ones can be part of the most current post on this topic.